Members of the corps are all Massachusetts-certified emergency medical technician (EMTs). The minimum training for an EMT required by the Massachusetts Office of Health and Human Services involves a 130-hour contact course, practical experience and a state examination. 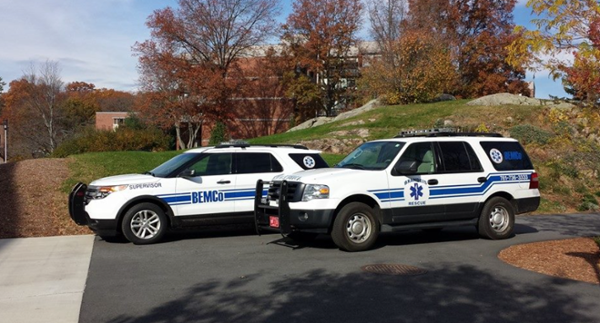 BEMCo provides additional continuing education to prepare members to handle the kinds of emergencies that are common on campus and to maintain skill and knowledge proficiency. Active BEMCo members are required to attend a minimum of three continuing education classes each semester. Classes cover a wide range of emergency medical services, include simulated call scenarios, and are approved for credit by the Massachusetts Office of Emergency Medical Services (OEMS). For more information contact the Training Officer. If a patient requires additional advanced life support care, BEMCo will request an ambulance from an outside agency for transport to a local hospital or trauma center. Neither ambulance transports patients, as per state regulations.